New Oreo Churros Coming to an Eatery Near You? 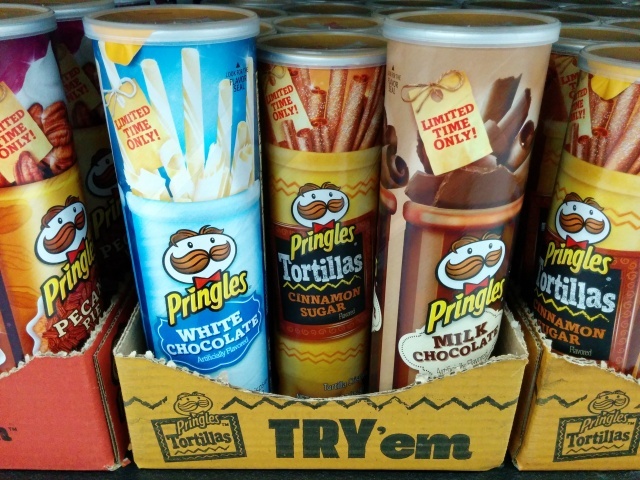 Milk Chocolate Flavored Pringles feature the distinctive potato crisps sprinkled with a powdered milk chocolate flavor. A 6.52-ounce canister was $1.50. If you've ever wished some company would deliver donuts to your doorstep, you're in luck if you live in the UK, where Domino's recently started delivering hot donuts in addition to their normal fare. Pepperidge Farm Chocolate Brownie Cookies are soft-baked brownie cookies with dark chocolate chunks. A 8.6-oz bag was $1.99 on sale. 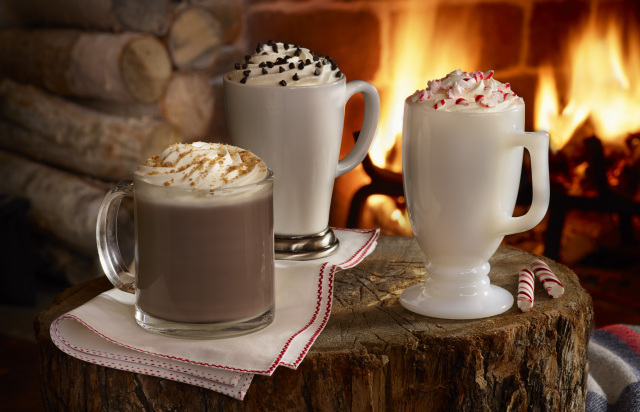 Caribou Coffee adds the new Gingersnap Cookie Mocha to this year's season holiday menu. The new drink features espresso, steamed milk, chocolate, and gingersnap syrup (hints of ginger, allspice, and clove), topped with whipped cream and crumbled gingersnap cookies. Over in the Philippines, KFC riffs on the Korean pop hit of a couple of years back with new Spicy Gangnam Chicken. The new chicken is part of a larger "KFC Food Trip" campaign inspired by flavors from around the world, and features spicy KFC chicken with a sweet and spicy Korean soy sauce-based glaze. It costs 99 pesos (~$2.20 US) and comes with chicken rice and coleslaw. Edwards' Pumpkin Creme Pie features a spiced vanilla cookie crumb crust layered with cream cheese and pumpkin filling, topped off with whipped cream. I bought a 25.9-oz pie for $5.99 on sale. 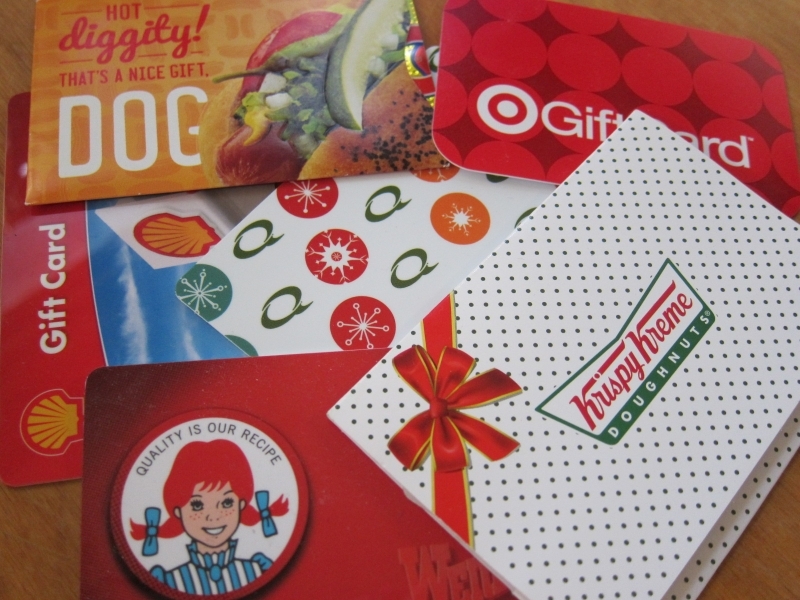 Here's a list I put together of all the extra holiday bonuses available from buying gift cards at some of your favorite restaurant chains. Please note that a lot of the bonus cards are more like bonus coupons and are not gift cards per se. They therefore have no cash value and an expiration date. You should check with the respective restaurants for details if you have any questions. I've listed the expiration dates where I could find them. 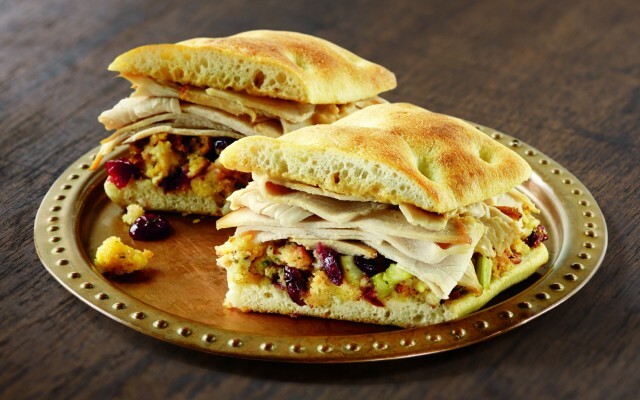 Starbucks' Holiday Turkey & Stuffing Panini features slices of roasted turkey, an herbed cranberry cornbread stuffing, and turkey gravy on toasted focaccia bread. It goes for $6.25 but I racked up enough rewards to get one for free. Blaze Pizza's S'more Pie features melted milk chocolate and marshmallow sandwiched between two large rounds of McVitie's biscuits. It cost $2 for one. 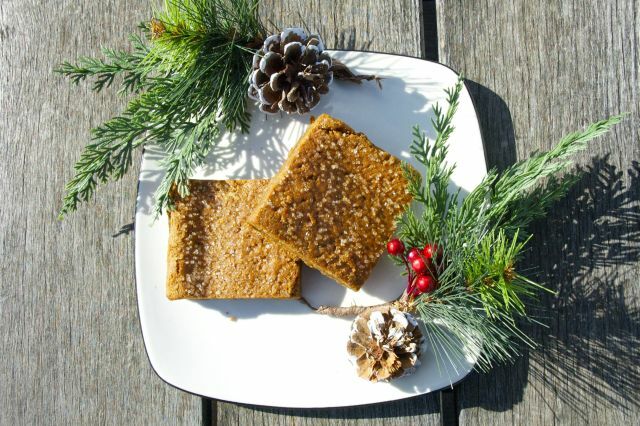 Just in time for the holidays, Quiznos offers the new Gingerbread Bar which can be toasted when ordered. The new, limited time baked good features brown sugar, molasses, and some holiday spices. They come sprinkled with sugar and carry a suggested price of $1.49 (may vary), while supplies last. 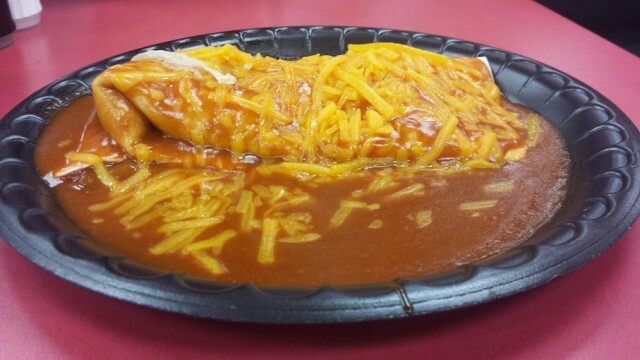 Hardee's-Red Burrito's The Red Burrito features seasoned ground beef, refried beans, and hot sauce all stuffed in a warm tortilla and topped with red enchilada sauce and a melted cheddar blend. I picked one up for $3.69. Here are some of the recipes from this year's Taco Bell 2014 Friendsgiving Feast. They had a number of recipe cards that they gave out and I've transcribed them here for you guys (with some edits for clarity and my own notes in parentheses). The Turkey Roulade wasn't on any recipe cards but I managed to get it anyway because it was awesome and my favorite dish there (I might try making it for Christmas). In case you want more, I also have the recipes from last year's event. KFC's Pumpkin Cake is a pumpkin Bundt cake drizzled with cream cheese frosting and pumpkin-flavored sauce. A 16-oz cake cost me $3.99 (it's also available as part of a Festive Feast). 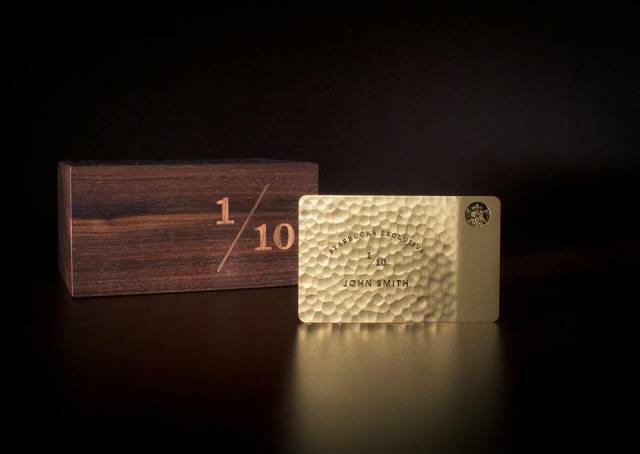 Starbucks recently released a photo of the Starbucks for Life card, which is good for a free food or beverage at Starbucks once a day, every day for 30 years. As you can see, the card appears to be made of (or made to resemble) hammered gold and is individually numbered and etched with its owner's name. It also comes in an individually numbered wooden box. 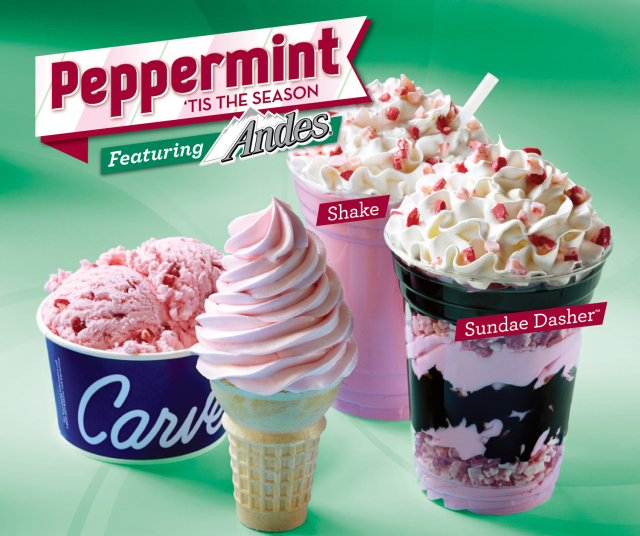 Carvel teams up with Andes Mints this holiday to come up with a line up of peppermint flavored soft serve and ice cream treats. - Peppermint Ice Cream - mixed with chunks of Andes Peppermint Crunch. 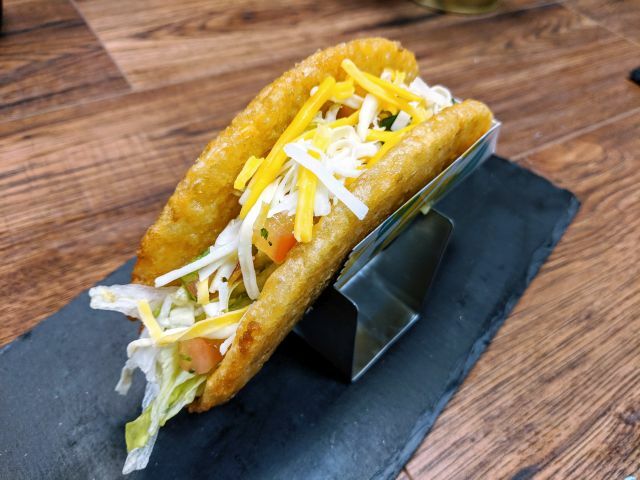 Taco Bell's new Rolled Chicken Tacos feature shredded, seasoned white meat chicken rolled up in a corn tortilla and deep-fried. 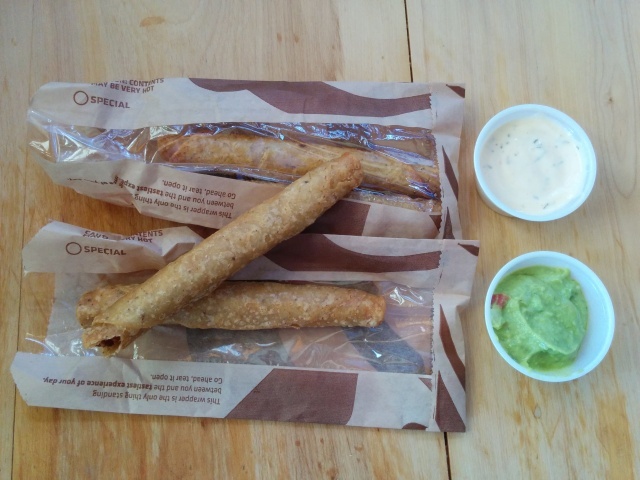 An order of four cost $3.99 and included two sauces for dipping (sauce choices include new Spicy Ranch, salsa, guacamole, nacho cheese, and sour cream). I went with Spicy Ranch and guacamole. You can also get an order of two with one sauce for $1.99 (which is a penny cheaper than buying four). 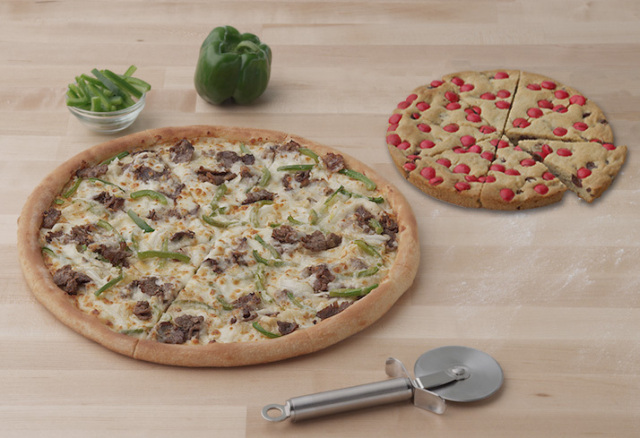 Papa John's follows up the Fritos Chili Pizza with another pizza inspired by an iconic American dish: the new Philly Cheesesteak Pizza. The new pizza comes topped with a creamy garlic sauce, thin-sliced steak, sliced onions, green peppers, plus mozzarealla and provolone cheese. It's being offered at $12 for a large. As a bit of a pre-Thanksgiving celebration before you start cooking up a storm (or watching someone else cook up a storm... or watching sports while someone else cooks up a storm, etc. 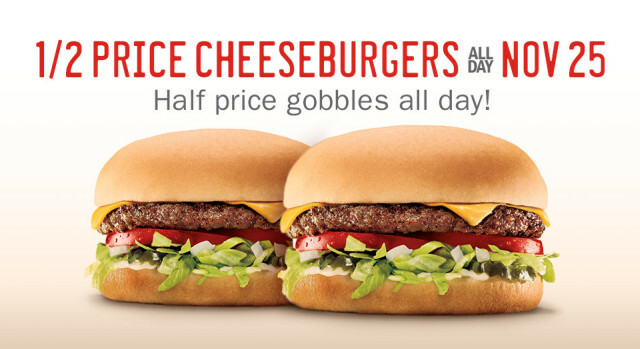 ), Sonic is offering a 50% discount on their Cheeseburgers all day tomorrow, Tuesday, November 25, 2014. Dark Chocolate Dipped Wavy Lay's Chips are exclusive to Target for the holiday season and feature Wavy Lay's potato chips dipped in dark chocolate and lightly salted. A 5-ounce bag cost me $3.99. 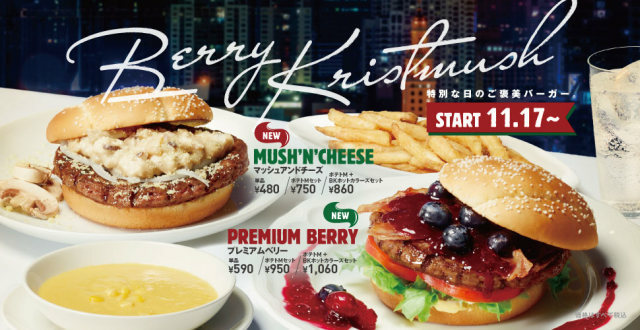 As part of a Christmas promotion, or rather "Berry Kristmush" promotion, Burger King is offering two holiday-themed burgers over in Japan: the Mush 'N Cheese and the Premium Berry. Krispy Kreme launches a line of new turnover-style Danishes at participating U.S. grocery stores and mass merchants. 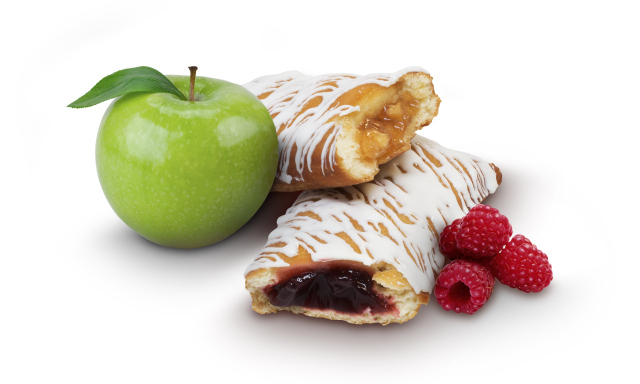 Available in two flavors, Apple and Raspberry, the new, individually-wrapped desserts feature fruit filling (apples and raspberries, respectively) inside a sweet crust, drizzled with white icing. Like the name sounds, Cinnamon Sugar Tortilla Pringles are the tortilla chip version of Pringles dusted with cinnamon and sugar. They're a limited-time flavor for this winter. A 6.52-oz canister was $1.50. Starbucks' 2014 Holiday Food Menu returns a number of seasonal regulars and adds the new Holiday Turkey & Stuffing Panini. The new sandwich features roasted turkey, an herbed cranberry stuffing, and turkey gravy on toasted focaccia bread. It goes for $6.25 (may vary). 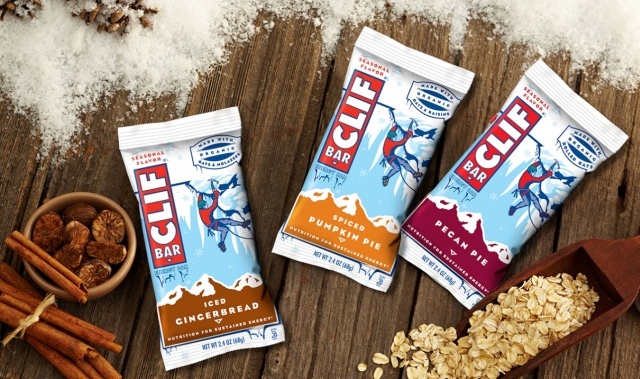 Clif Bar returns three seasonal holiday flavors for 2014: Iced Gingerbread, Pecan Pie, and Spiced Pumpkin Pie. The 2.4-ounce energy bars are meant to mimic their respective holiday dessert and carry a suggested retail price of $1.39 each. They're available nationwide, while supplies last. Chili's Island Chicken & Rice frozen meal features roasted white meat chicken in a jerk sauce with rice mixed with pineapples, Southwest-style vegetables, and black beans. A 10-ounce box was $2 on sale. 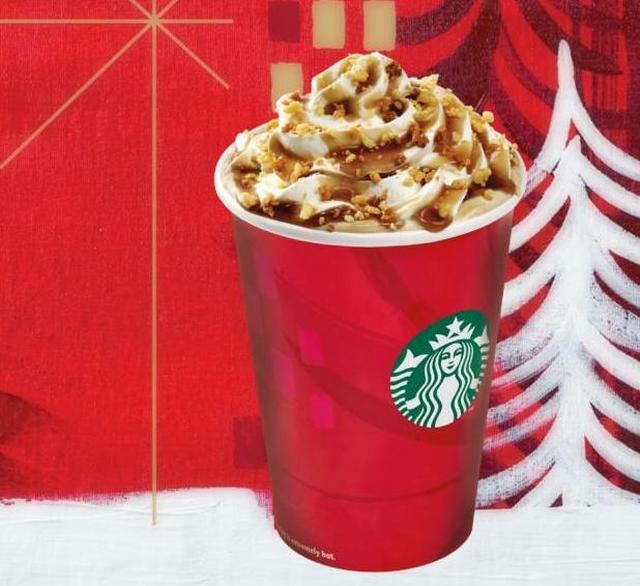 New this year in Australia, Starbucks introduces the new Christmas Cookie Latte. If you're like me, you're probably picturing a latte flavored with sugar cookies and frosting, but it's actually made with a shortbread cookie sauce. Red Robin's 2014 holiday menu includes the new Holiday Turkey Burger as well as a tower of mini-croissant donuts that they're calling "Doh! Rings." 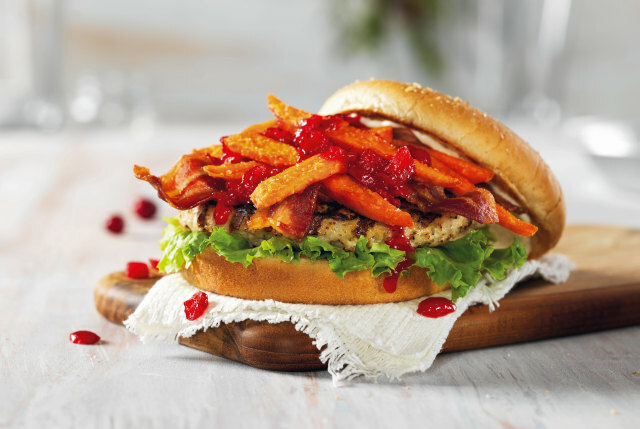 - The Holiday Turkey Burger is a turkey patty topped with sweet potato fries, bacon, green leaf lettuce, mayo, and apple-cranberry relish on a whole-grain toasted bun. The suggested price is $10.49. Checkers / Rally's latest limited-time value is the new Primetime Steakhouse Double for $1.99. They've also introduced new Grilled Cheese Strips. Smashburger's local L.A. Smashburger features a crispy wonton wrapper, fried egg, cilantro, cucumber, ginger dressing, lettuce & tomato on a black & white sesame seed bun. I bought the "Regular Burger" version for $6.39 (they also have a "Big Burger" version with a larger patty). 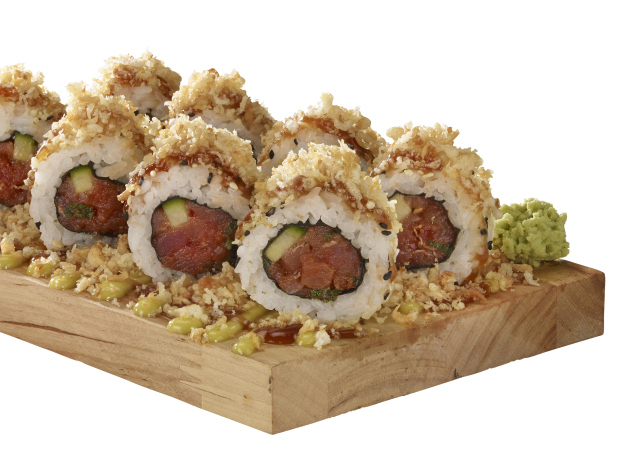 Pei Wei adds some crunch to their sushi rolls with two new Sushi Crunch Rolls. Available in Teriyaki and Wasabi, the new rolls get their crunch from fried tempura flakes. The Teriyaki Crunch Roll features Premium Pacific krab, sweet mango, and tempura flakes, drizzled with teriyaki sauce and wasabi aioli. 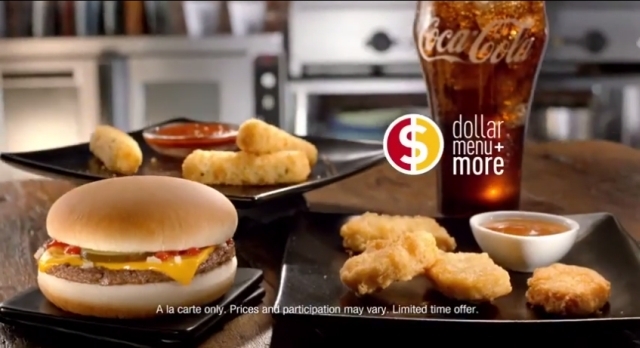 Perhaps in a bit of regional testing, McDonald's expands the lower end of the Dollar Menu & More in the New York Tri-State Area by offering the Cheeseburger, new 3-piece Mozzarella Sticks, 4-piece Chicken McNuggets and 16-oz soft drink for $1 each for a limited time. Mars Chocolate introduces a new, limited edition Snickers candy bar this month: the Snickers Mixed Nuts bar. The new bar combines the signature peanuts with almonds and hazelnuts before finishing up in typical fashion with caramel, nougat, and milk chocolate. Pizza Hut's Pretzel Piggy Pizza is part of their new "Flavor of Now" menu expansion and features a hand-tossed pizza with a garlic parmesan sauce topped with bacon, mushrooms, and fresh spinach, plus a drizzle of balsamic sauce and a salted pretzel crust edge. It cost me $11 for a large pizza with a carryout deal (the pizza is normally $14.99). Starbucks once again offers a special Brewed Coffee Refill Tumbler starting this Thanksgiving, November 27, 2014, while supplies last. The special tumbler typically makes an annual appearance around this time of year and is good for one Grande brewed coffee each day of January 2015 when brought to a participating Starbucks location. Target adds new Wavy Lay's Dark Chocolate Dipped Chips heading into the holiday season. The new chips are joined by the return of Wavy Lay's Milk Chocolate Dipped Chips, which were first introduced last year. 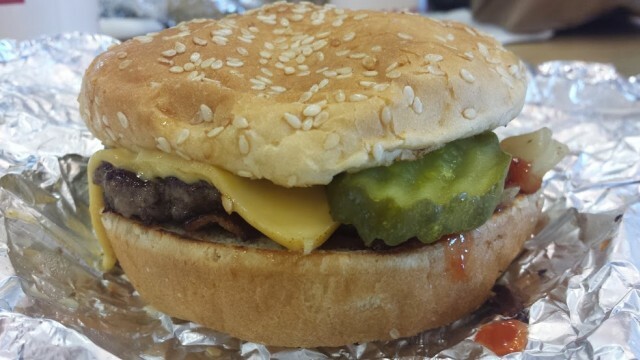 Five Guys' Little Bacon Cheeseburger comes fresh off the grill and features a single beef patty, bacon, and a slice of American cheese plus a choice of toppings. I paid $6.09 for one at my local store. Haagen-Dazs Peppermint Bark ice cream and ice cream bars have once again made their annual return for the holiday season. Additionally, you can find limited-time Peppermint Bark Milkshakes and Sundaes at Haagen-Dazs Scoop Shops. 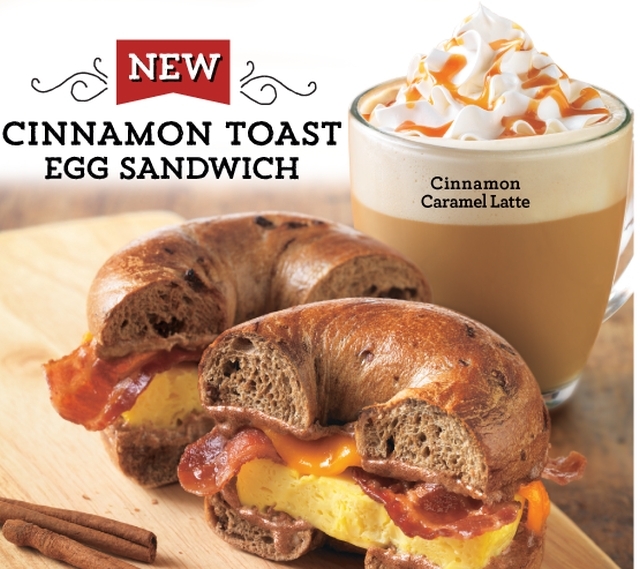 Einstein Bros. (and Noah's Bagels) goes with a cinnamon theme for this year's holiday menu, including a new Cinnamon Toast Egg Sandwich. The new sandwich offers scrambled eggs, Applewood-smoked bacon, cheddar cheese, and a cinnamon-butter blend on a Cinnamon Raisin Bagel. Starbucks' Chestnut Praline Latte combines espresso, steamed milk, and a spiced caramelized chestnut syrup for a wintry drink. It comes topped with whipped cream and spiced praline crumbs. A 12-oz Tall was $4.15. Bojangles is once again taking pre-orders on limited-time Seasoned Fried Turkeys at participating locations heading into Thanksgiving. 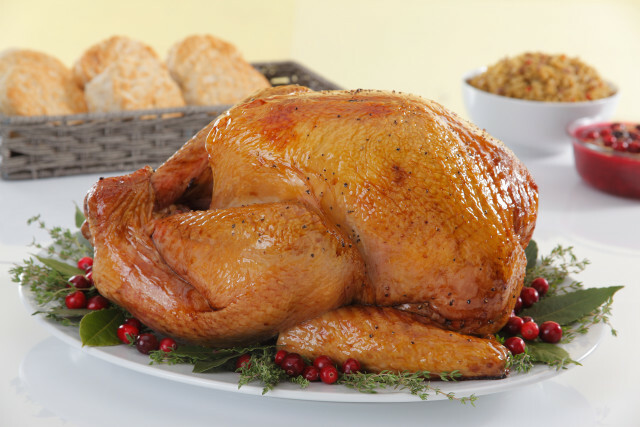 The turkeys are roasted, fried in vegetable oil, frozen, and then shipped to restaurants. 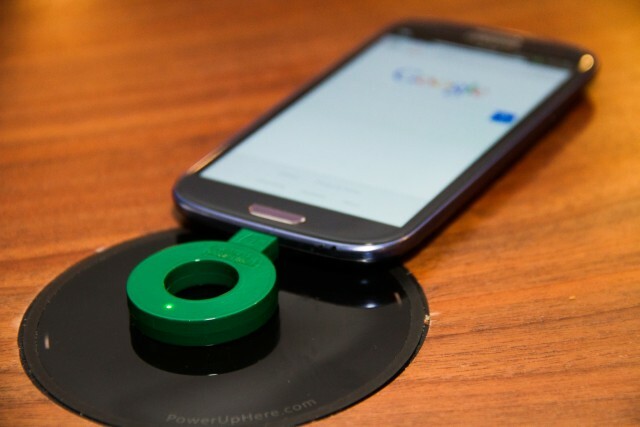 Starbucks adds free Powermat wireless charging to about 200 locations in the San Francisco Bay Area as the first step in a nationwide rollout. The stores feature "Powermat Spots," which are designated (and literal) spots on tables and counters where customers can place their compatible devices to charge them wirelessly without any need to take up an outlet. 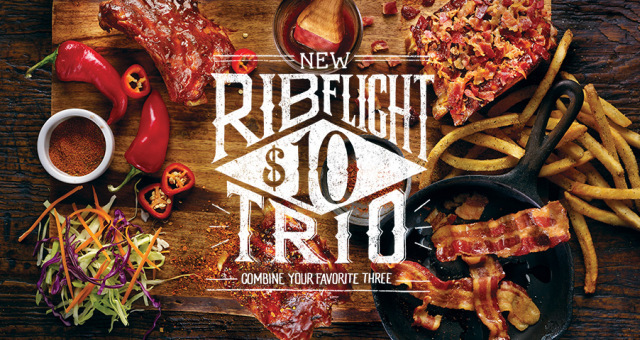 TGI Fridays offers some rib variety with their new Rib Flight Trio. The special offers a choice of three of the chain's rib flavors for $10. KFC's Loaded Potato Bowl offers a slightly different take on their Famous Bowl and features a bowl of mashed potatoes and gravy topped with corn, diced Extra Crispy chicken strips, a new bacon cheese sauce, green onions, and three cheese blend. I bought a bowl with a 20-oz drink for $5 (sadly, no chocolate chip cookie was included at my local KFC); the bowl was also offered by itself at $3.99. 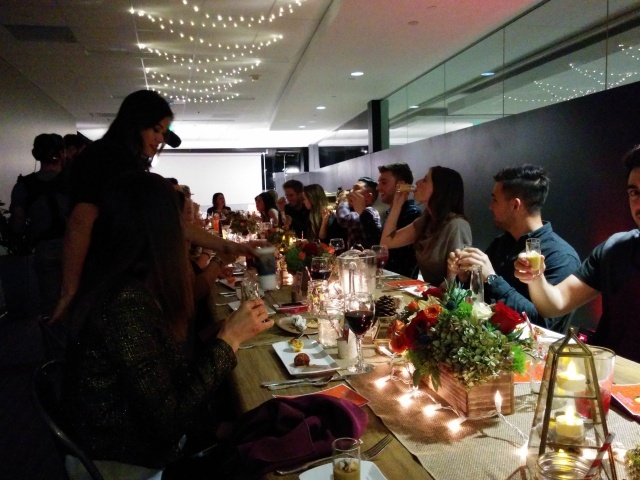 Taco Bell held their second annual Friendsgiving event last week and I was on hand as an invitee (I also went last year), so I thought I'd share with you the Thanksgiving-type feast that was prepared by Taco Bell's chefs (i.e. the people who come up with new Taco Bell menu items)... with a Taco Bell twist of course. Wendy's Bacon Portabella Melt on Brioche burger returns for a limited time as Thanksgiving nears. 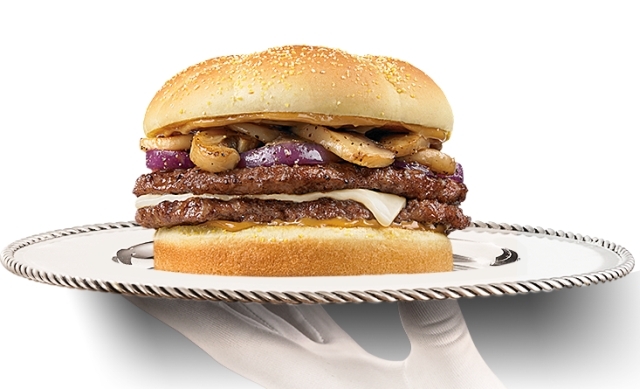 The burger was first introduced last year as a Bacon Portabella Melt with an upgraded bun. Peet's Coffee is offering a deal where you can get one of this year's holiday beverages for free with a food or bakery purchase. You'll need this coupon though. 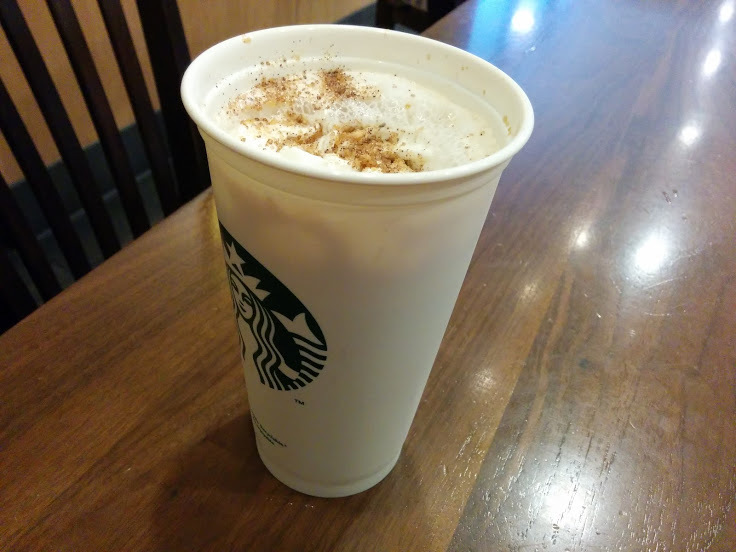 They've also introduced a new Cinnamon Hazelnut Latte. 7-Eleven offers a Peppermint Mocha for the 2014 holiday season as well as new Cinnabon Gooey Bites (microwavable mini Cinnabons). Nonni's Pumpkin Spice Biscotti are pumpkin spice-flavored biscotti dipped in cinnamon icing. The suggested retail price is $3.29 per 6.88-ounce box but I received this courtesy of Nonni's. Pringles introduces new Milk Chocolate-flavored potato crisps as one of two new flavors for the 2014 holiday season to go along with three returning flavors. The other new flavor is Cinnamon Sugar Tortilla Pringles and both are exclusive to Walmart stores. Please bear in mind that the Milk Chocolate ones are milk chocolate-flavored Pringles and not milk chocolate covered. There's a dusting of seasoning on them. Perhaps as a mea culpa for doing away with the $5 Featured Footlong, Subway is offering their $2 Customer Appreciation deal a bit earlier this year. Under the promotion you can get either a 6-inch Cold-Cut Combo or Meatball Marinara Sub for $2.